In my recent sojourn to Somerset and Bath, I met Vivien Lloyd and her husband Nigel at her home in Midsomer Norton. 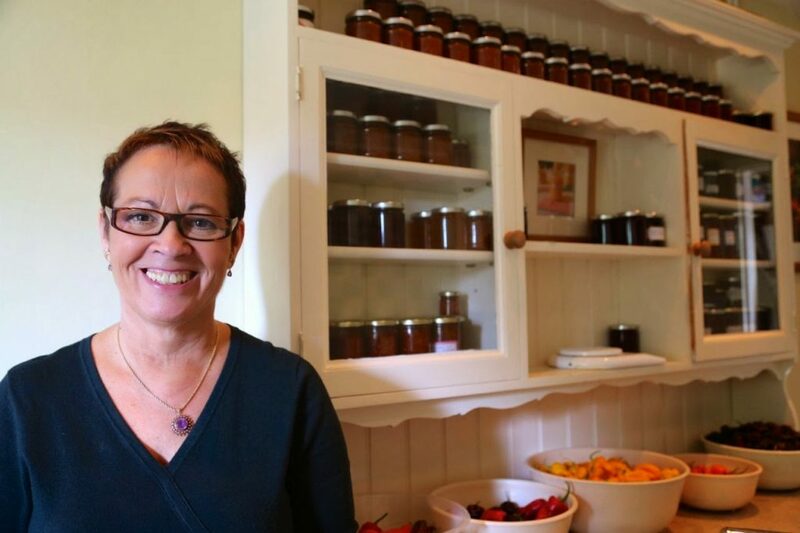 Vivien produced a book, First Preserves, about jam making, preserves, chutney and pickles a couple of years ago. I didn’t realise that this very glossy and professional-looking book was self-published until I visited her. Vivien Lloyd comes across as rather angry about jam but this intensity is a product of her passion. The natural authority with which she talks, glasses perched upon her nose; she reminds me of an Anne Robinson of the preserves. She can be blunt, even harsh, about the woolly amateurish recipe developing of less trained jam makers. No wonder, as Vivien trained as a Women’s Institute judge 21 years ago when the regime was rigorous. 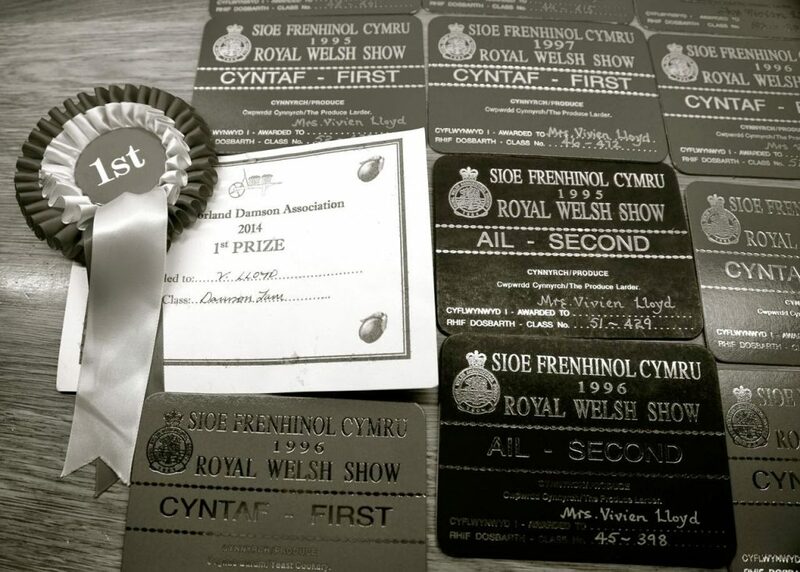 “You had to make 5 preserves a day, one day a week for between 18 months and 2 years, you had homework, a working notebook, an exam, you had to regularly enter competitions and shows”. 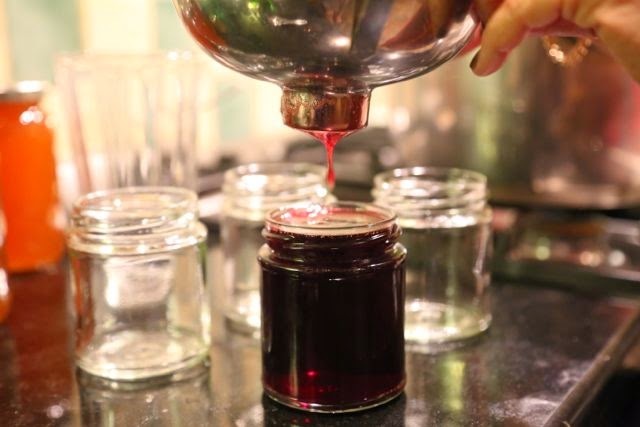 The repertoire you had to master commenced at the start of the preserving season, September to March; split into Autumn preserves and after Christmas marmalades (to coincide with the citrus season). There are 12 different disciplines in which you must be proficient or even expert. As a W.I. judge you were expected to make all of the above at least once each calendar year. Vivien remarked that the hardest thing as a judge is the comments. You must not only tell the competitor what is wrong with their entry but also how to put it right. I use the past tense here because according to Viv, standards at the W.I. have slipped. Vivien says the training isn’t worth doing anymore. W.I. judges no longer have the same rigorous standards, they do not know how to steer competitors to improve and celebrity culture has taken over in the rigid world of preserves. “The W.I. has dumbed down the judging, there is poor feedback and lower standards. Woe betide any jam making pretender who is not doing it by the book. 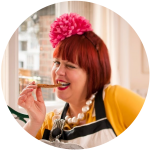 This is her scrupulous analysis and testing of the recipes on the Great British Allotment Challenge. The 60% figure was set by British scientists at Long Ashton, Bristol, in the 1920s and was based on scientific principles. Low sugar alternatives have a looser quality and often resort to preservatives (Potassium Sorbate) to lengthen shelf life. Clippy Mckenna is campaigning for jams with less sugar to be allowed. Vivien, although she considers Clippy to be a worthy opponent, thinks that the trend towards less sugar is based on the fact that as a commodity, sugar has gone up in price. Sugar has been demonised, regarded as poison, but as Vivien explains, “I don’t sit and eat a jar at a time”. Defra put out a proposal to amend the legislation to reduce sugar to 55% or 50% with apple, which has gone through in Scotland (ever the unfortunate guinea pig territory for experimental legislation, e.g. the poll tax). The consultants for this kind of food legislation are big businesses like Pizza Hut, who obviously know nothing about jam. So Vivien decided to visit her local MP for Wells, Tessa Munt, to resist this change. Tessa Munt immediately saw the seriousness of the situation – “I’m going to get a debate on this in parliament” – and even asked Vivien Lloyd to help write the speech. Vivien is mentioned in Hansard. For the time being, the Defra amendment has not been implemented, but the reduction in % of total sugar content is still a possibility. Tessa Munt told Vivien that this is one of the most popular issues she has ever tackled, everywhere she gets stopped and people say, “Well done about the jam, Tessa”. 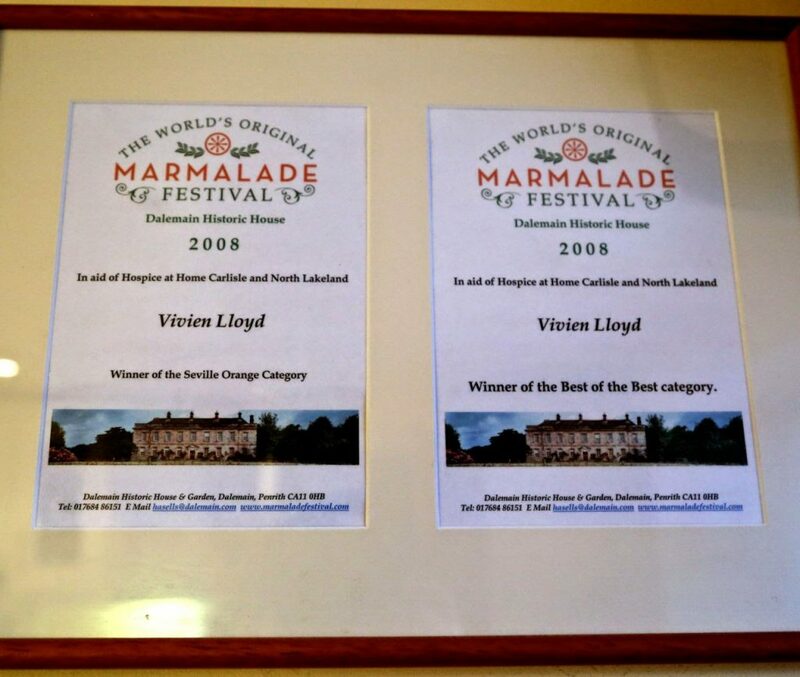 One of the things that Vivien prides herself on is that her recipes give an accurate yield. Most of them are for four jars of 250g. Doing preserves in small batches means that you can make them more quickly, get a set. Before the 1920s no jam or marmalade recipes gave yields. Vivien has plans to teach jamming boot camps, some at the Seville Orange farm, Ave Maria, in Spain, and in the USA, France and Australia. 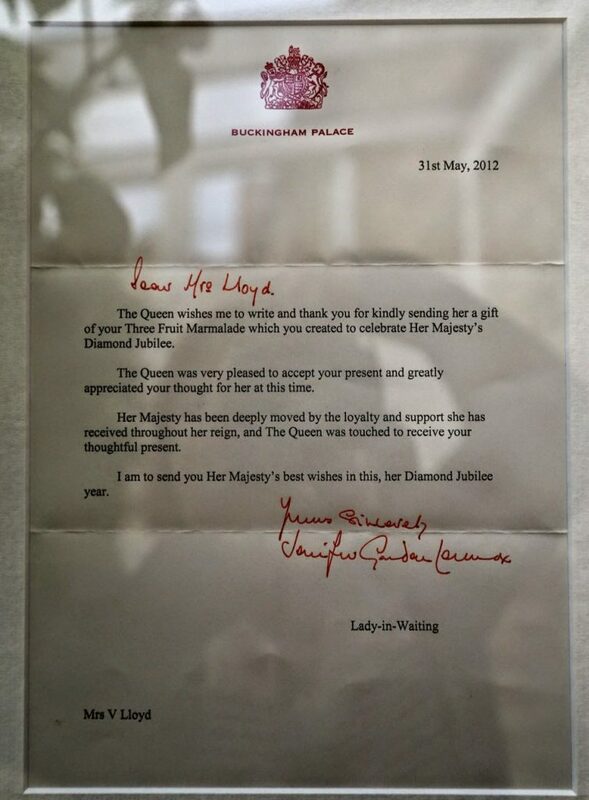 One year, Vivien sent a jar to the Queen and is very proud of her letter back. The Queen is a marmalade fan. Damsons are her favourite fruit. Jellies: people make them too liquid. Jelly is harder than jam. Only make small quantities at a time. You get a quicker set, 4 minutes. The longer you boil, the quicker you are boiling the flavour away. Yield in recipes is often wrong. Amount of sugar depends on pectin and acidity of fruit. She doesn’t macerate. She does the added check of weighing after she has reduced her fruit then adding the correct amount of sugar. Marmalade has double the sugar to fruit. 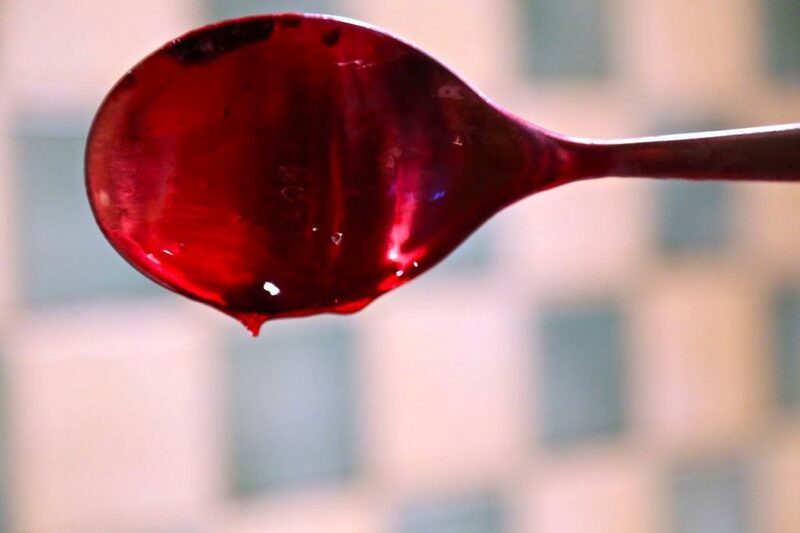 Do a pectin test: to a tablespoon of cooked fruit, add a tablespoon of white spirit or meths. It will immediately form a jelly if there is enough pectin. Don’t use jam sugar. It makes a rubbery set. Make your own pectin if the fruit you are using doesn’t have enough. Marmalade is a citrus fruit jam. The muslin bag should contain all the trimmings, peel and pips, which contains the pectin. Grapefruit pith will ‘go clear’, translucent, just like Seville oranges. Marmalade requires slow, gentle, cooking. Don’t rush, otherwise the peel won’t be tender. Men tend to like a thick macho rind in their marmalade, but the finer you can slice the peel, the more pectin and acid. 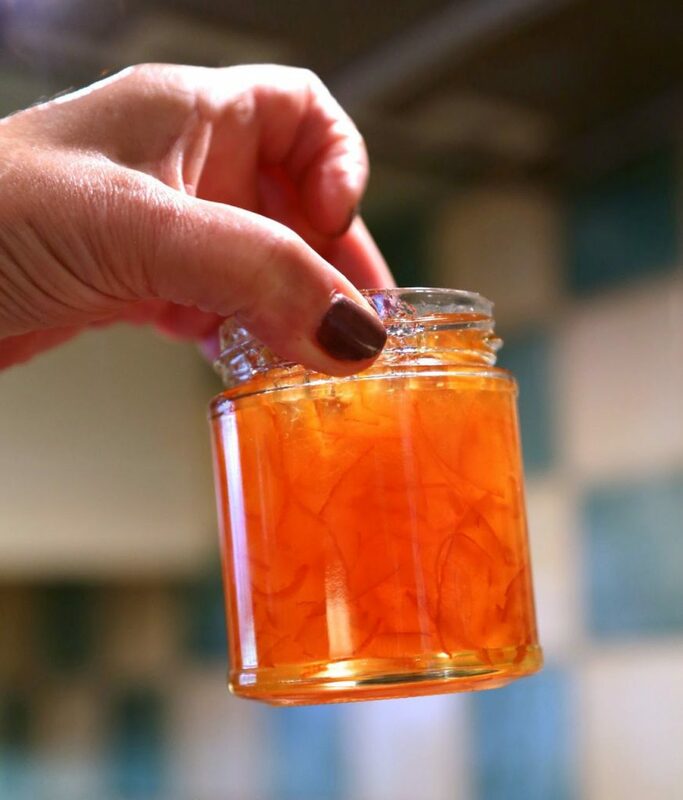 Reduce marmalade liquid by a 1/3rd, warm the sugar, which helps it to dissolve, and you are less likely to get crystallisation, peel should disintegrate between your fingers. Relishes and chutneys are not to be confused with each other: chutney is slow cooked and takes a couple of months to mature. Relish is a quick cook, is sharper and can be eaten immediately. Use a plastic spoon for tasting chutney. I am such a jam, mostly marmalade, and jelly person. I just love the letter from the Queen and welcome her boot camps down here in Australia. Another timely posting K, as I eating a lot cauliflower raw and thinking preserves might be the thing to do, so will investigate the links you've provided. Still recovering from Wedding Cake Blitz…. a piece of work on both sides. Good stuff. I love raw cauliflower…let me know what preserves you make!